Landscaping is an investment in your property for years to come. You want to trust that investment that is being spent on to a professional, well-qualified, established company. Choosing Lanager’s Landscaping with the help of Chris Lanager who has a Bachelor Degree in Horticulture from Penn State University assures you complete dedication to the goal of achieving a quality job that fits your budget. Ornamental Trees and shrubs can add a variety of color and texture to balance the overall design of your landscape. The selection of plants, shrubs, and trees must be able to thrive in our climate and be the right size choice for the desired location. We take the guess work out of the decisions and give you fresh new ideas to get the landscape design you want. We offer cost-effective solutions to fit your desire for a beautfiul landscape that fits your budget. Our installations are done by trained employees who know proper planting techniques along with fertilizing the newly installed shrubs. We put down a landscape fabric that acts as a weed barrier between the ground and the mulch or stone of choice. 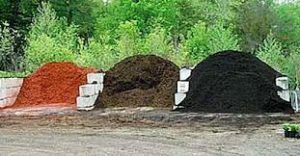 We use only the highest quality products including northern-grown plants, shrubs, and trees along mulch and stone products to give that professional-finished look. You can achive your property’s full potential by utilizing our professional equipment and expertise. Proper watering can help encourage your landscape shrubs as well as your lawn to survive the dry months of the year. Watering systems that are properally installed can save time by automatically turning on or off without you tending to them. Irrigation can also be easy to manage and control using the newest technology and products available. A beautiful home and landscape should be visible even at night. This is where landscape lighting is essential. Let us help you accent not only the beauty of your home at night, but also offer safety with lighting of pathways and entryways. Outdoor lighting also increases the functionality of outdoor living spaces. Professionally installed lighting will definitely enhance the visual appeal of the landscape you love. Small ponds and water features can make your landscape unique and different. They provide a gorgeous back drop for entertainment areas or just as a focal point in the landscape design. The healing and health benefits of water features have been around for centuries. Not only can a water feature be visually pleasing, but the sound of a waterfall while you are enjoying the outdoors in your landscape is breathtaking.